Merry Christmas. Here are the complete Ante-Nicene works subtitled “The Writings of the Fathers Down to A.D. 325” – about 11.000 pages. The collection of books consists of 10 volumes (one volume is indexes and I could not find this in a electronic version) containing English translations of the majority of Early Christian writings. The period covers the beginning of Christianity until before the promulgation of the Nicene Creed at the First Council of Nicaea. The translations are very faithful, but sometimes rather old-fashioned. These translations are now in the Public Domain, they were first published in 1897 in United States. My guess is that you would also be delighted to know that I also have the entire 14 volumes of Nicene and post-Nicene fathers of the Christian church. 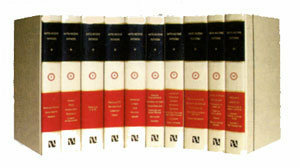 Originally printed in 1885, the ten-volume set, Ante-Nicene Fathers, brings together the work of early Christian thinkers. In particular, it brings together the writings of the early Church fathers prior to the fourth century Nicene Creed. The files below are huge, please be patient when downloading. Volume I. The Apostolic Fathers with Justin Martyr and Irenaeus, Clement of Rome, Mathetes, Polycarp, Ignatius, Barnabas, Papias, Justin Martyr, Irenaeus. Volume X. Bibliographic Synopsis; General Index. Outstanding! Thank you and many blessings. Thank you so much for this, it will help me greatly in my masters thesis. Thank you; you saved me $100! Do you have any of the other parts to this series? i.e., Series I and II of the Nicene and Post-Nicene Fathers? God bless you greatly thanks a lot! Many thanks for making this available online. Hi Sidney, you are welcome. Let me know if you have any suggestions or questions. THESE TEN VOLUMES BECAME A ‘GATEWAY TO WISDOM!’BEING A CHRISTIAN MY QUEST WAS A SEARCH FOR WISDOM AND SO VOLUME 4 ESPECIALLY THE WRITINGS OF ORIGEN WHO DEALS WITH WISDOM CHRISTOLOGY WHICH DESERVES MUCH MORE ATTENTION THAN EVER PONDERED IN THE PAST. WHY IS CHRIST CALLED THE HIDDEN WISDOM AND ITS RELATIONSHIP TO PROVERBS 8:22-23? THIS CAN BE FOUND IN ‘ORIGEN DE PRINCIPIIS’ PAGES 246-251. READ THESE PAGES AND BE AWAKENED TO THE HIDDEN MEANING OF DIVINE WISDOM/SHE BEING THE BEGINNING,PRINCIPLE AND MATRIX OF CREATION FOUND IN PROVERBS 8:22-23 AND ITS RELATIONSHIP TO THE HIDDEN WISDOM JESUS CHRIST BEING THE LOGOS/WORD WHICH IS ALSO INVOLVED IN CREATION INHERENT WITHIN HER ‘YET’ NOT THE LOGOS HIMSELF. THIS IS COMFIRMED IN VOL lll,pg 502 ‘WISDOM WAS FIRST SET UP, THE BEGINNING OF HIS WAYS, FOR HIS WORKS…THEN THAT THE WORD WAS PRODUCED.” ACCORDING TO THE TO THE JEWS THIS WISDOM IS THE PRIMEVAL TORAH WHICH PRE-EXISTED CREATION ALONG WITH THE WORD/LOGOS WHICH EMANANATED FROM HER FOR THIS WISDOM IS FEMININE AND ACCORDING TO THE COMMENTARY ON PROVERBS OF KEIL AND DELITZSCH , MENTIONS THAT THIS WISDOM OF PROV. 8:22, IS NOT THE WORD/JESUS CHRIST BUT ‘MEDIATRIX’OF CREATION. HENCE THE LOGOS BECOMES A MEDIATOR UNDER THE NEW DISPENSATION FOUND IN THE NEW TESTAMENT. HENCE, IN PROVERBS 8:22-23, WISDOM IS REALLY LIKE A HEAVENLY MOTHER WHICH CAN ALSO BE FOUND IN THE BOOK OF WISDOM OR SONG OF SOLOMON! READ AND BE ENLIGHTENED TO THIS MYSTERY PAR EXCELLENCE. Thanks, I have uploaded it here. Thank you very much for the nine volumes. I am learning early Christian history, and appreciate having these, as I cannot afford to buy the books. May God Bless you for making these works available to us. This connection to the Christian past is precious! Thank you very much for providing this to us all. I am very grateful to you for these texts, which are helping me in my research in Philosophy and Theology. Thank you! Just discovered your site! Wow! Can not say enough praise for your work. Just DL-ed the Ante-Nicene Fathers Series. Thank you for your efforts in setting up this source of study material! You are welcome :-) Please help spred the word about this site. Wow, thank you for posting these! It should be “Reprint” instead. I thank you! You are so welcome here, please share and let me know if you have any suggestions for the site. As I am not in the position to buy the expensive 10 volumes, I consider them a great blessings and in turn I wish you His great blessings for such treasures of yours shared with thousands of disciples who are hungry for the same. Thanks a lot and may GOD bless you all abundantly.